PanARMENIAN.Net - Astronomers from the Byurakan Astrophysical Observatory in Armenia have discovered a strong outburst of the embedded young stellar object (YSO) designated UKIDSS-J185318.36+012454.5. This newly detected event could provide important insights for the understanding of eruptive variability of young stars. The researchers presented their discovery in a paper published December 30 on the arXiv preprint server, Phys.org reports. UKIDSS-J185318.36+012454.5 is located in the vicinity of the IRAS 18507+0121 source and probably belongs to the massive star-forming region associated with GAL 034.4+00.23 HII region. The object is at least 5,000 light years away from the Earth and its neighborhood contains massive protostars with an age of about 100,000 years, as well as a low-mass stellar population approximately 1 million years old. The stellar object was classified as an intermediate mass YSO less than 100,000 years old. 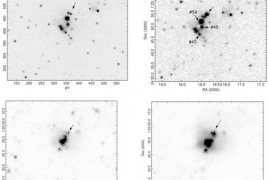 Recently, a team of researchers led by Elena Nikoghosyan has combed through the data and images provided by the United Kingdom Infrared Telescope (UKIRT) in Hawaii to search for evidence of outbursts in star-forming regions. They used the archival infrared and submillimeter data from UKIRT Galactic Plane Survey (UKIDSS GPS) and found that an outburst occurred in UKIDSS-J185318.36+012454.5 in the period of 2004-2006. "UKIRT Galactic Plane Survey is a deep survey with good space resolution. Therefore, it provides very useful information for researchers who study star forming regions. In particular, for detection of UKIDSS-J185318.36+012454.5 outburst, UKIRT Galactic Plane Survey was the basic source of information," Nikoghosyan told Phys.org. According to the paper, the amplitude of brightness of the detected outburst is at least five mag. The object remained at this level of brightness until 2014. The results of the research allowed the scientists to re-classify UKIDSS-J185318.36+012454.5 as an eruptive variable with mixed characteristics, namely a MNor-type object, and Nikoghosyan emphasized the significance of the study. "Eruptions of pre-main sequence stellar objects are rare events, thus a new outburst is always noteworthy. And I think that the discovery of a new eruptive variable UKIDSS-J185318.36+012454.5 with a so strong outburst (delta K > 5 mag) was a big success," she said. The authors of the paper also sought the most plausible explanation for eruptive variability of young stars. They noted that several physical mechanisms, such as rotation, cool or hot spots, accretion-driven wind and outflow can explain the near-infrared variability, but these mechanisms often produce short-term variability with amplitude that is not expected to exceed one mag in the K band. "In our opinion, all of the proposed explanations of this phenomena to date (eruptive variability of young stars) do not explain it completely, most likely due to lack of information. With respect to this object, we can only assume that this outburst corresponds to the transition between two evolution stages: Class 0 (no optical and near-infrared emission) and Class I (generally optically obscured). But this is only an assumption," Nikoghosyan concluded. The researchers now plan further observations of UKIDSS-J185318.36+012454.5. However, these studies could only be conducted in collaboration with scientists from other countries due to the fact that in Armenia, there is no opportunity to observe this object in the infrared range.